Lock in a great price for Hampton Inn Southport – rated 9.1 by recent guests! Very clean rooms and whole bldg. Very clean pool area. Great service and friendly staff. Exceptional breakfast, menu changed daily. Super clean, friendly staff. Nice free breakfast. Bed was very comfortable. Room and bathroom were very clean. Coffee available 24/7. Great variety for breakfast. 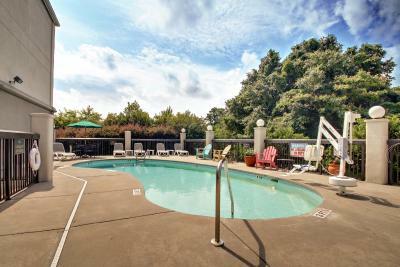 The pool was very clean, the staff was very courteous and helpful. Hampton Inn has the best breakfast of all comparable hotels. Breakfast was better than your average continental breakfast, everything was clean and neat, staff were helpful when needed. Front desk staff was wonderful. Cheerful clerk wrote down directions to airport for me when the lobby printer didn't work. Maintenance staff were exceedingly cordial. All Staff was very friendly and helpful. Room was very clean, beds were comfortable. Check in and out wAs very easy. The staff is super friendly. They all treated us like we were house guests. Wonderful experience. The info that was given above location from Carolina Beach was ten miles we had to travel 40 miles to get to the beach. When asked why ten miles was beautiful web page was informed it’s ten miles as a crow flies. I’m not a crow. Hampton Inn Southport This rating is a reflection of how the property compares to the industry standard when it comes to price, facilities and services available. It's based on a self-evaluation by the property. Use this rating to help choose your stay! Located along Highway 211, this hotel is 2.5 miles from historic downtown Southport and the North Carolina Maritime Museum. 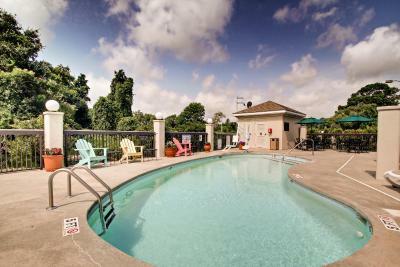 It features a hot breakfast, an outdoor pool and free Wi-Fi. A microwave and a mini-fridge are furnished in every spacious room at Hampton Inn Southport. The traditionally decorated rooms feature a flat-screen TV and in-room coffee. Fitness and business facilities are offered for guest use. Guest laundry services and free daily newspapers are available. Bald Head Island is a 14-minute drive from Southport Hampton Inn. Oak Island Golf Course is just 5 miles away. When would you like to stay at Hampton Inn Southport? House Rules Hampton Inn Southport takes special requests – add in the next step! Hampton Inn Southport accepts these cards and reserves the right to temporarily hold an amount prior to arrival. Please note the property does note have direct access to Carolina Beach or Kure Beach. These can be reached by a ferry to Fort Fisher or by driving. Driving distances are will be over 1 hour as guest will have to use roads near the coastline. A/C Left a lot to be desired. It struggled to cool the room. Room was a bit on small side for 2 adults and 2 kids. Pool was surprisingly small and no hot tub. A little pricey especially if you took advantage of the rate that included the ability to cancel. IMHO that ability should apply to all the rates and bookings. Our room was not clean properly. The elevators were too small and lines formed. More elevators are needed. It was humid and we had air conditioning on, but room felt alittle musty at times. Room wasn't well cleaned; tub was partially clogged so water from shower didn't drain well. Furnishings/carpet were showing wear. It was clean pretty and everyone was VERY NICE AND HELPFUL!!! !